Rhuna Star Child - A Review! 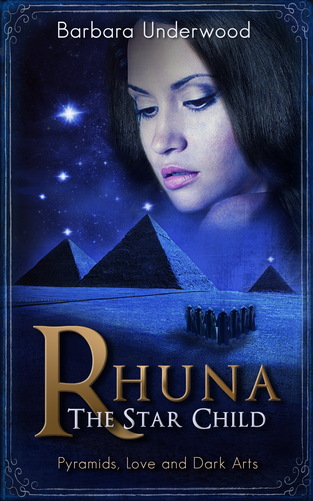 This thrilling sequel to Rhuna: Crossroads is set in mystical Ancient Egypt where Black Magic was developed by the followers of the legendary villain, The Dark Master. As strange and frightening curses plague the population, Rhuna discovers the underground organization that performs this uncanny new magic, but she can only combat it with the help of her long-lost father. Having learned from her father amazing new skills to empower her on the Astral Plane, Rhuna once again strives to preserve peace and harmony in the idyllic Atlan civilization. Far more challenging than fighting powerful Dark Forces, however, is Rhuna’s personal anguish when her daughter becomes involved with the leader of the Black Magic movement, and the once-perfect Atlan society based on utopian principles begins to crumble all around her. Shocking events escalate Rhuna’s world to a breathless climax as she and her family undergo a momentous upheaval, and she is forced to make great personal sacrifices for her loved ones. Barbara Underwood was very kind to me and sent me out this book which I am so grateful for because it came all the way from Australia!! I gave this book a good chance but to be honest, I couldn't get into it! I've found that this genre of books just isn't for me but I did enjoy being transported to another world and completely losing myself in the story. Rhuna seems to struggle with having to reconnect with her father and having him help her combat the new magic which is threatening to defy her world. It's very interesting to follow Rhuna's journey and learn how they use Gazing Waters to see into the lives of others; as Rhuna does with her child, Loriza. She learns that her daughter has fallen in love with the leader of the Black Magic Movement and this is where the adventure begins. At some point, I may pick this up again to finish but for now it sits on my shelf. As an only child of older migrant parents, I was exposed to a different culture and outlook as I growing up in the suburbs of Sydney. At the age of 10 I became interested in history and travel, and in sixth grade my teacher commented on my flair for writing. After a lot of travel and reading about history - I started with Thor Heyerdahl's adventures which led me to other books about unexplained mysteries such as pyramids and other megaliths around the world - I came to a point where I wanted to put it all together in an epic fantasy novel. I have now written two further books following on from "Rhuna, Keeper of Wisdom." The 2nd and 3rd books are both set in Ancient Egypt, and I am working on the fourth book in the series, so stay tuned and enjoy "Rhuna"!